Happy Friday everyone! I have such a fun pie to share with you today. There’s nothing I love more than supporting crazy talented and creative people, and today we’re doing just that. 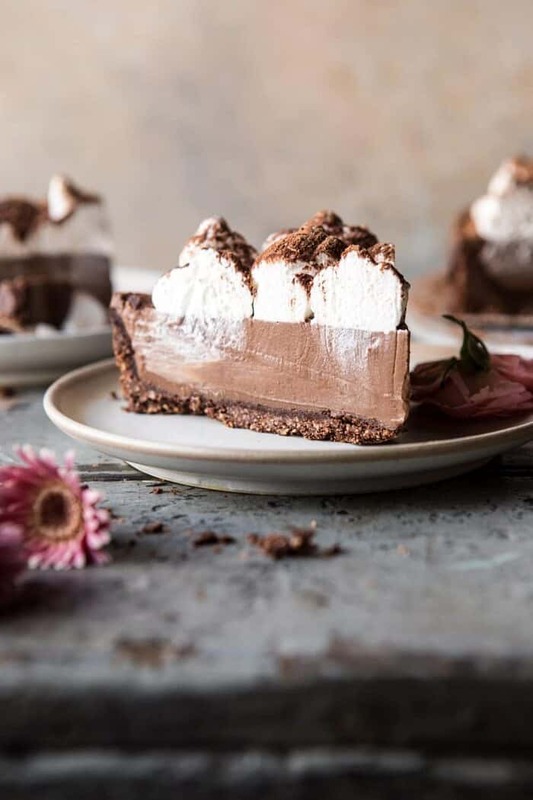 I can’t wait to tell you guys about The Sweet Laurel Cookbook, which is where this delicious chocolate pie comes from. For those of you who are not familiar with Sweet Laurel Bakery, it’s a company that uses only the best and most wholesome ingredients, specializing in delicious grain-free, dairy-free, and refined sugar-free baked goods. I know, I know, crazy, right? You might wonder how anything that’s grain-free, dairy-free, and refined sugar-free could be good, but you guys? The sweet girls behind Sweet Laurel, Laurel and Claire, know how to make healthy desserts taste good. Really, really GOOD! 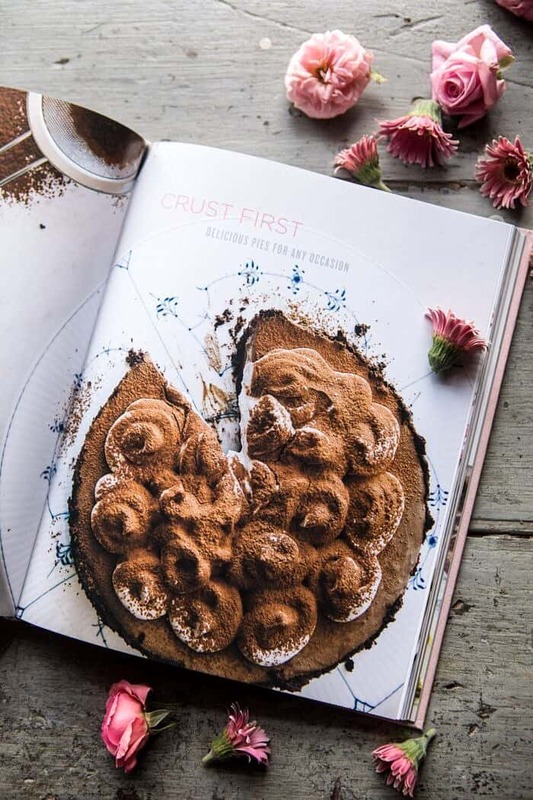 Their healthy baked goods have become so popular that together they decided to create a cookbook! YES! 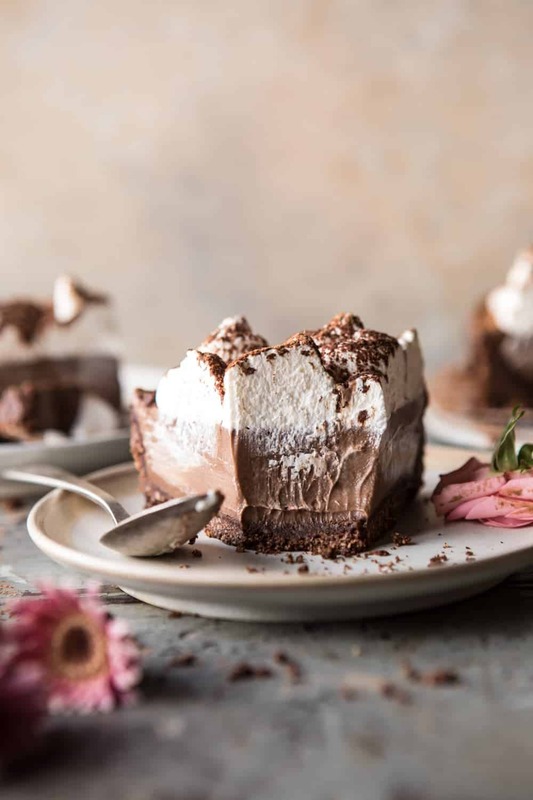 Trust me, this is very good news for us, as their cookbook is full of their many delicious recipes, secret tips for creating grain-free baked treats, and stunning cakes. If you could not already tell, I am very excited about this book. As soon as I received the book in the mail, I immediacy began flipping through the pages. So many beautiful photos, accompanied with beautiful writing, and of course, good-looking, mouth watering sweets. My list of recipes to make is a mile long, but some that really excite me are: the lemon poppy-seed bundt cake, mixed berry breakfast tarts, and pretty much every single layer cake. 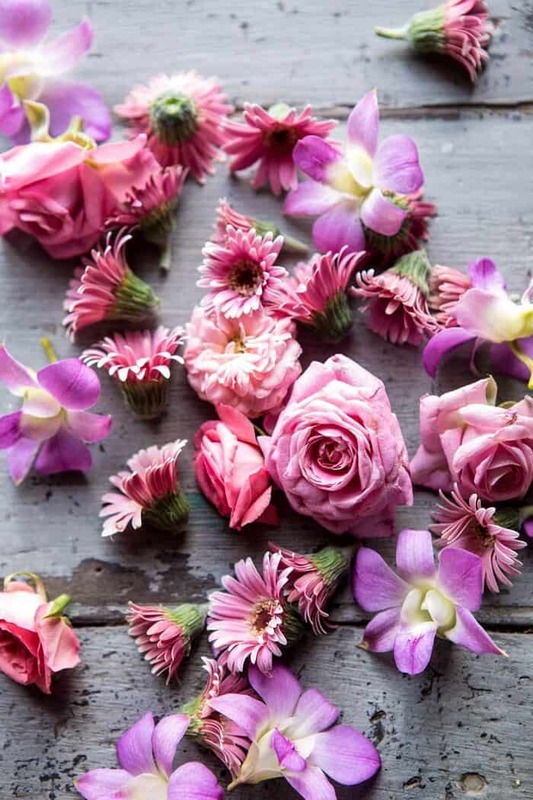 Because one, they all sound delicious, and two, I can cover them in flowers, which you know I love so very much. When it came to choosing a recipe to share with you guys, the decision was easy. 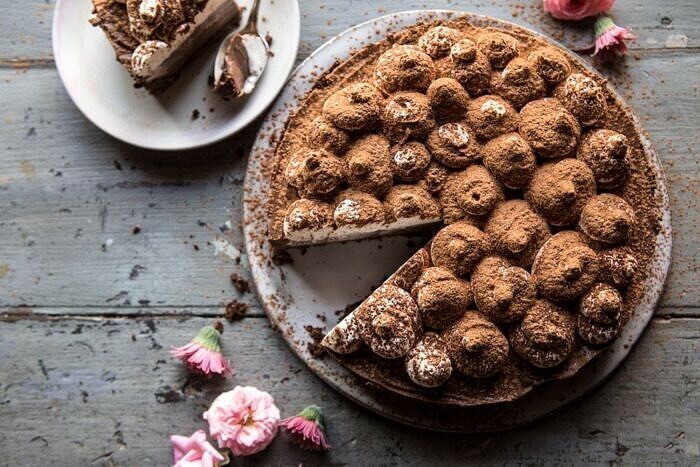 I knew I needed to make this dark chocolate chiffon pie. I mean, DO YOU SEE IT?! 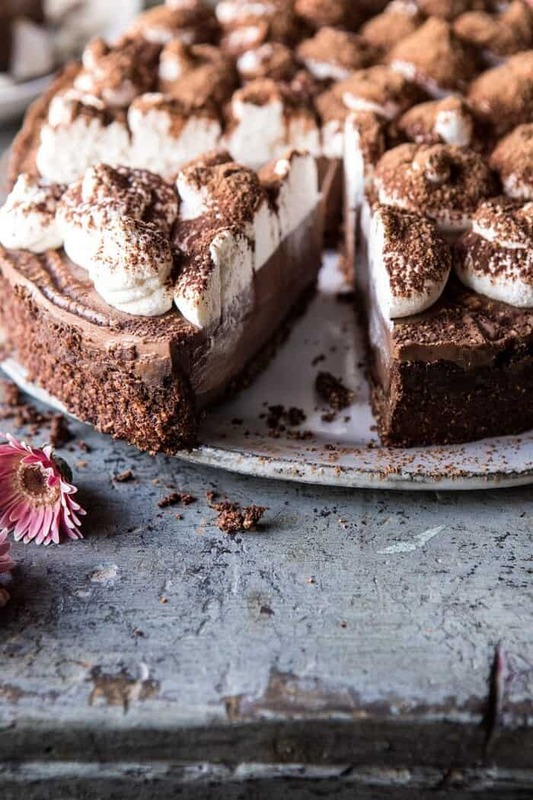 It’s two layers of rich chocolate, and one layer of coconut cream. 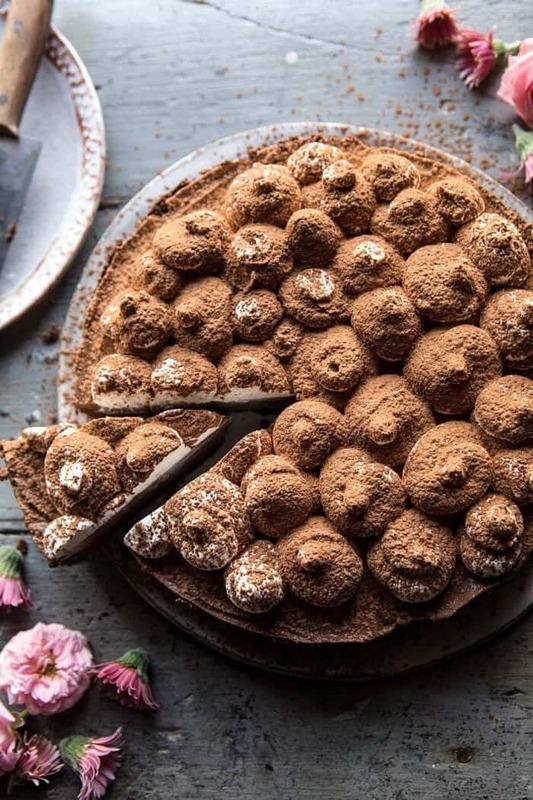 So basically, my dream pie. I was in love with it the second I flipped the page and saw it’s chocolate dusted fluffy mountains of coconut cream. Everything about this pie is delicious and wholesome. The crust is made of nuts, the filling is all dark chocolate and coconut cream, and the top has even more coconut and chocolate. It’s silky, smooth, and creamy, extra chocolatey, and just a little bit coconutty. It’s also light, yet rich, sweet, but not too sweet…truly just perfection on so many levels. Each and every bite is so amazingly good. The best news? You don’t even need to feel guilty about eating this pie. I mean, it’s (incredibly) free of refined sugars and gluten. 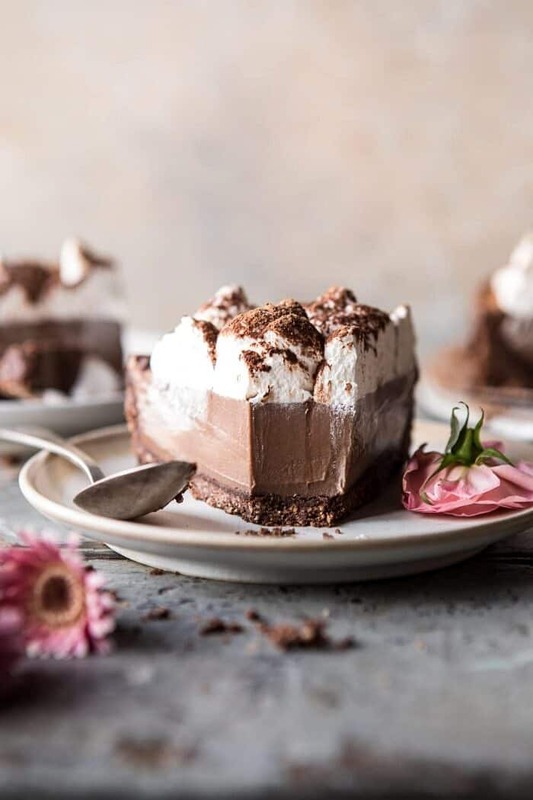 Guilt free chocolate pie? Count me in. As noted in the cookbook, this does require an overnight chilling, so be sure to plan ahead when making this. It’s perfect for pretty much any and all occasions, but I do think it’s especially perfect for Mother’s Day, spring gatherings, and every other warm weather event after that (summertime anyone?). It’s also equally perfect for this weekend. Just a suggestion. Everything about this pie is delicious and wholesome. 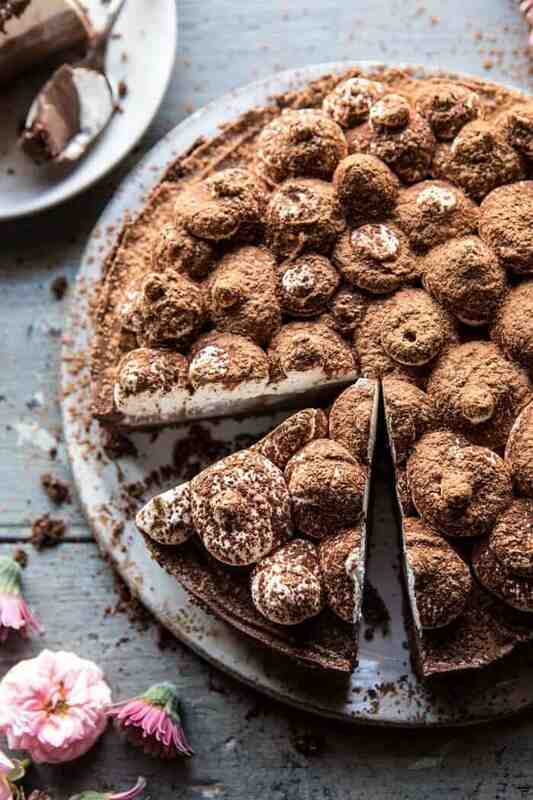 The crust is made of nuts, the filling is all dark chocolate and coconut cream, and the top has even more coconut and chocolate, so delish! 1. Preheat the oven to 350 degrees. Generously grease a 9-inch pie pan with coconut oil. 2. To make the crust. Combine the nuts, coconut oil, date paste, salt, and cacao powder in a food processor and pulse until the mixture forms a ball. Press the dough into the pie pan and bake for 10-12 minutes, until fragrant and set. Set aside to cool. 3. To make the filling. Pour the coconut milk into a small saucepan and sprinkle the gelatin on top. Set aside and allow the gelatin to soften for about 5 minutes. In a medium bowl, whisk together the egg yolks, maple syrup, and vanilla, set aside. 4. Take the saucepan of coconut milk and gelatin and whisk over low heat until smooth and warm. Take 1 cup of the warm coconut/gelatin mixture and add it to the egg yolk mixture, stirring constantly. Pour the entire egg yolk mixture back into the saucepan and mix well. Add the chopped cacao, cacao powder, and salt. Whisking constantly, bring the mixture to a simmer and cook for 3 to 5 minutes, until thickened. Transfer the filling to a bowl and refrigerate until cool but not quite set, about 40 minutes. 5. 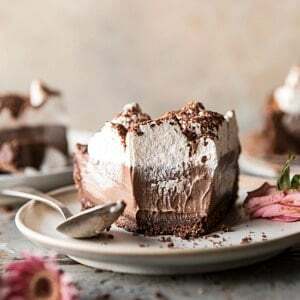 Fold 2 cups of the coconut whipped cream into the filling, then pour the filling into the crust and refrigerate overnight, or for at least 8 hours. 6. Top with the remaining whipped coconut cream and sift cacao powder over the pie. Serve immediately or refrigerate for up to 2 days. 1. Remove the solid coconut cream that has risen to the top of the can, and spoon it into a stand mixer fitted with the whisk attachment. Beat the coconut cream on high-speed until it begins to thicken and peaks form. If the cream is too thick, the remaining coconut water can be added, a teaspoon at a time, otherwise, discard it. 2. Using a rubber spatula, slowly fold in the maple syrup and vanilla. Transfer the whipped cream to a metal or glass bowl, cover and refrigerate until ready to use. Recipe reprinted with permission from Sweet Laurel. If you’re interested in learning more about Sweet Laurel, you guys really need to check out their site. The story behind why they started the bakery is so cute, and if you ask me, the perfect Friday read! 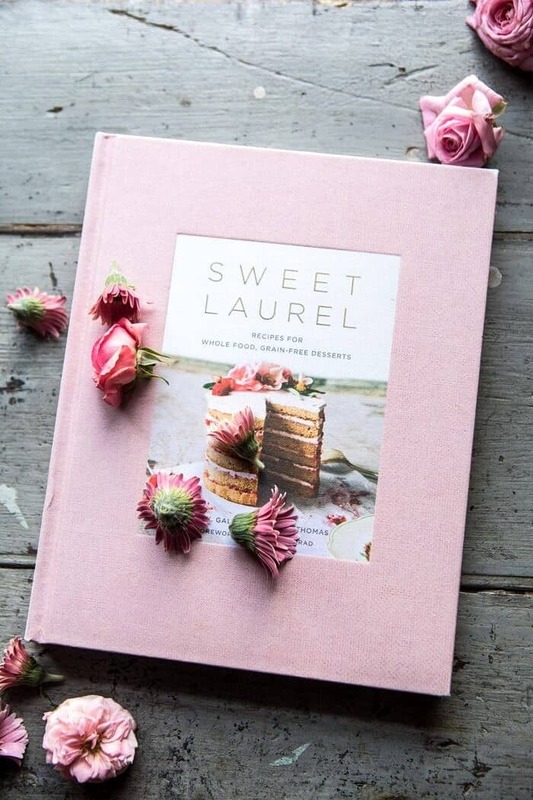 And of course, if you love this pie, be sure to grab a copy of the Sweet Laurel Cookbook too! 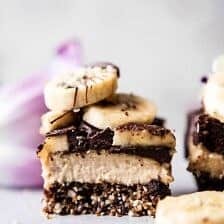 Raw Chocolate Banana Cashew Cream Pie Bars. 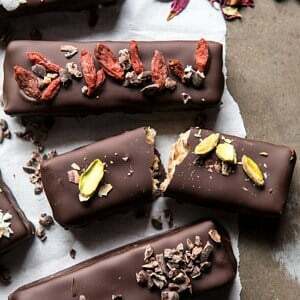 Dark Chocolate Covered Coconut Bars. 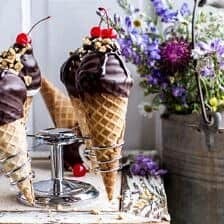 Hot Fudge Brownie and Double Scooped Ice Cream Sundae High Hat Cupcakes…in a Cone! Thx for sharing ! The ingredients for the coconut cream will make enough for the 4 cups plus the additional that is spooned in top ? Did you pipe the cream in top ? Also can I simply use medjool dates instead of the paste ? If so how many approx? Oh dear ! Why am I not surprised ? 🙂 Beautiful ! 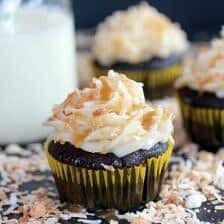 I love the look of the coconut cream topping! Your photos are just stunning as always! Also, I may just need to get this book. You totally should! I hope you love this recipe Caroline! This sounds perfect, between the filling and topping, how many cans of coconut cream are used? Thank you! Looks beautiful. Did you use a pie pan or springform? Your sides look straight and tall for a pie tin. I think this is perfect formy birthday! Just added to my shop list items I need!!!! Thank You!!! I hope you love this pie Billie! Also, Happy Birthday! good lord I want to eat this. now. Haha so wish I could share! I hope you make this Ruth! Thank you! I saw Laurel’s book release and already bought it! And now that I see this post I am even more positive that this was an excellent decision. Can’t wait to bake this weekend! I hope you love it Amanda! Thank you! This is to die for! But, what is date paste? oh my goodness this sounds and looks absolutely incredible!!! I desperately wish we could taste through the screen now! Thank you! I am so glad you like this! Wish I could share!! Your pics look beautiful! Gonna try this recipe to check the taste but i think it will impress me! 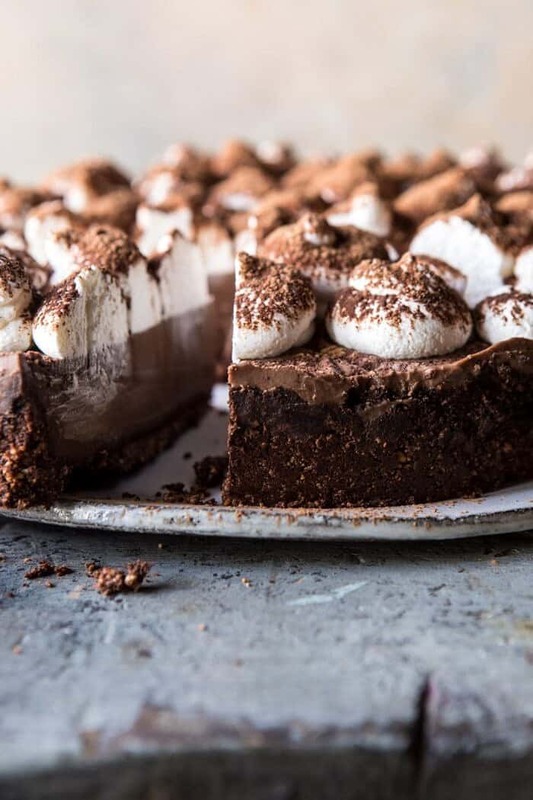 This dark chocolate chiffon pie looks fabulous, but I I can’t stand coconut. Do you know of anything else I could substitute to make this top layer? Thank you! I have your cookbook & absolutely love it & your style. Dark chocolate? Guilt-free? Pie? Sold, sold, and sold! This looks delicious and your photos are beautiful! Thank you so much! I am so glad you like this and hope you try it! I made this the other day for a family cookout and it was a huge hit! Nobody would believe me when I told them that it only had about a half a cup of maple syrup lol. It was so rich and delicious. Thank you so much! I am so glad you loved this Alison!